Pickup groups allow users within the same group to answer each other calls. If a colleague's telephone is ringing, one can answer that call by picking up one’s own set and dialing ** (star key twice), instead of walking to the colleague’s desk. Figure 11.1 Add Pickup Group. Click Add button located in the Pickup Groups panel. Drag and drop members of your new group from Users panel. Enter a pickup group name. Figure 11.2 Edit Pickup Group. 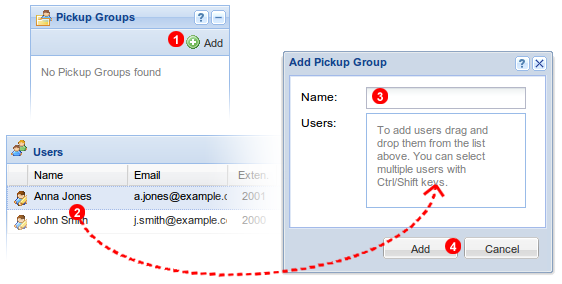 To edit Pickup Group settings click on the icon (1) located on the left to the group name.